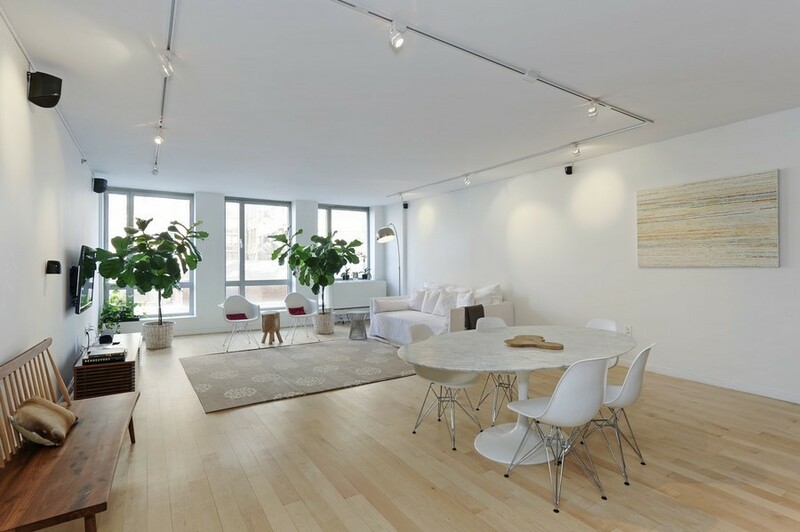 Feng Shui gives breathing room in certain spaces like in this modern condo in Chelsea, NY. This luxurious condo in Chelsea, New York, had nice modern details, but lacked some charm and coziness for this family. This condo feels like a loft, with oversized windows and high ceilings and large rooms. Metal is everywhere. We managed to minimize the flaws of the condo; however, I would not have advised my clients to buy that apartment if they had showed me alternatives. But it is always possible to make a space better. My clients like a minimalistic style, and love white (silver element) and metal. While silver and white can be great colors, they are not exactly a plus when we are looking for harmony in relationships. The other main challenge was the fact that the front door was aligned with the large windows in the dining room. Adding Wood (with plants, furniture, etc.) was paramount to "minimize" all the surplus of Metal and dry out some of the emotional turmoil. The two fig trees are meant to retain the energy coming into the house, so the Chi cannot escape as soon as it enters. They are also a welcome break from the sounds of the city, and natural air purifiers. Greenery is extremely important in a modern condo like this one. Adding peaceful symbolism and objects in pair (in the love corner, which is the back right corner of the living room), adding the Fire element (through lighting and purple objects) contributed to appeasing the energy of the dining/living room. In the Master bathroom, you can notice some stones at the bottom of the toilet (and inside the tub) meant to retain the energy. In the children bedrooms, a minimalistic style is balanced with playful colors. The couple called me after having lived for a while in the apartment, complaining of disagreements. The result is a more welcoming home, with adequate protection from the hustle and bustle of the city.